Intresting question. The only information I know is post Corsa. 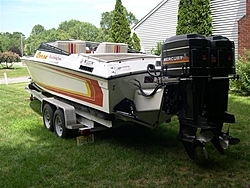 the 30" Corsa became the 30' Midnight Express open, then the 32 midnight open, then the 34' Super Hawaii. Any more info would be cool. Im wondering these same questions. Whats the beam? Were they laid up heavy? I have the last 26 Corsa made it is a 1995 . It is strong but light because they are pretty small. They measure 24'10" by 6' 7". Mine has a one off deck and was the last Hog's Breath boat. I have a beautiful 84 for sale. At a reasonable price in my opinion and no takers. Be careful before you take on the project. if you just plan on selling it, you'll probably lose money. Money is tight and i doubt you'll get back what you put into it.